It is the first weekend of October and I haven’t bought a single bag of [airquote] halloween [/airquote] candy. Air quotes required. Because any bag of candy purchased on October 6th probably won’t live to see October 11th around here. And by probably, I mean definitely. And by around here, I mean around me. Last week, we had the Candy Talk. Rather than throw the feed store-sized bag of candy into the cart, I countered with a “How about I just make something.” Because I know my limits and they don’t stop at Blow Pops or Tootsie Rolls. [sigh] Or even Smarties. Or those off-brand M&Ms that fool no one but they’re still almost chocolate and sometimes there are days where that almost counts. Instead, I just got The Look. You know the one, it’s part, “Why can’t you just pick up a pack of Reese’s Peanut Butter Pumpkins like a normal girl and call it a day?” and part “I love you but I swear to the heavens that I’ll never put another dirty sock into the hamper for as long as I live if I find a stashed bag of those crappy orange & black candies in the house.” Peanut Butter Kisses have never gotten the respect that they deserve. I settled on making caramels to appease Jason – they’re his favorite non-Reese’s candy that don’t come in cattle feed-sized bags. 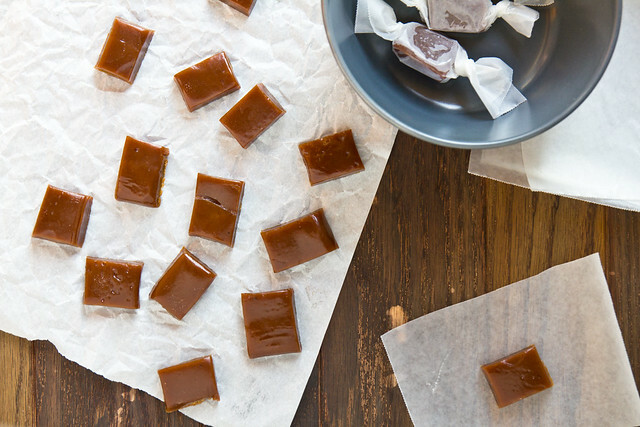 I took his favorite caramels and gave them a fall makeover with brown sugar, molasses, and some homemade pumpkin pie spice. 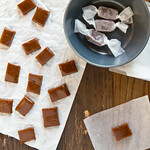 The cinnamon, nutmeg, cloves, ginger, and allspice really add a nice warmth to the caramels that really compliments the richness of the molasses. Of course, adding molasses to the mix does make it a little trickier to know when to add the cream and spices (this is done when the sugar mixture turns amber… but it starts out amber in this recipe) so make sure you have a candy thermometer handy. They’re inexpensive and will save your caramel from dying a scorched, smokey death. And if you’ve never tried the sea salt caramels, you must! They really are the perfect combination of chewy, sweet, salty, and buttery. And candy. If that’s your thing. And for another treat, make Pumpkin Spice Caramel Syrup – rather than cooking the caramel mixture to 248, you simply add the cream mixture as directed below, let it bubble, stir it to mix well, remove from heat, and let it cool. Just add ice cream! Coffee! Or hot chocolate. Or anything else you’d drizzle caramel syrup over. Like those fake M&Ms. Because that’s the only way those things are edible. 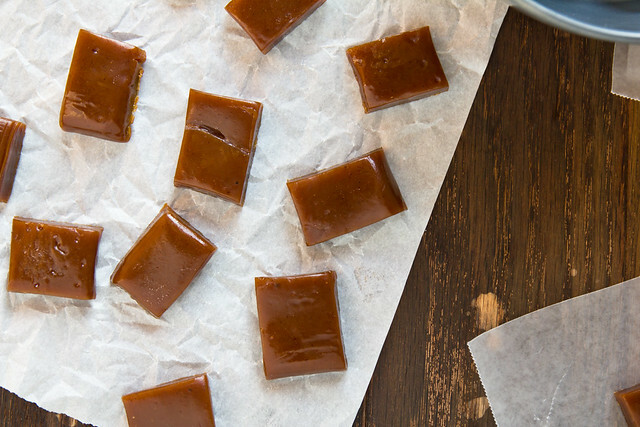 Homemade pumpkin pie spice gives these chewy, buttery caramels a makeover for fall. Stir together the ingredients for the pumpkin pie spice in a small bowl until mixed well, making sure to press out any lumps with a spoon. Leftover spice can be stored in a small airtight jar or a zip-top bag. Bring cream, butter, vanilla, salt, and 2 tsp pumpkin pie spice just to a boil in a small saucepan, then remove from heat and set aside. Boil sugars, corn syrup, molasses, and water in a 4-quart heavy saucepan, stirring until sugar is dissolved. Attach a candy thermometer and continue boiling without stirring (just gently swirl the pan occasionally) until mixture reaches 310-315. Carefully pour in the cream mixture into the caramel (take care, mixture will bubble up) and simmer, stirring frequently, until caramel registers 246-248 on thermometer. 246 will give you a softer caramel that will stretch when you bite it but is easily squished or flattened, especially in a warm house. 248 will give you a firmer, still chewy caramel. Pour into baking pan and cool completely (about an hour). Cut into 1-inch pieces (a buttered pizza cutter is your best friend), and then wrap each piece in a 4-inch square of wax paper, twisting 2 ends to close. These sound wonderful! I agree with your husband…those PB Kisses are disgusting. I would rather starve to death before eating one of those! Reese’s are absolutely NOT allowed to enter this apartment no matter how much I think I can control myself around them…because I can’t. There’s no way. I actually DO have some caramel apple snickers around here and have for weeks…but that’s only because I don’t particularly like them. These caramels, however, would be dangerous. Very dangerous. In a delicious way. This post made me laugh, and these caramels sound so good. What a great idea! Man, my homemade candy never looks that good. It looks… well, homemade. And what are fake M&M’s? Are you talking about Sixlets? Would this recipe work for making caramel apples? I think the spice would add a nice touch. Looking to made these delightful treats for Thanksgiving, how far in advance do you think I should make them? Are they stored in the refrigerator? Thanks! Don’t store them in the fridge, just a ziptop bag at room temp. You can make them a few weeks ahead of time, they keep really well.